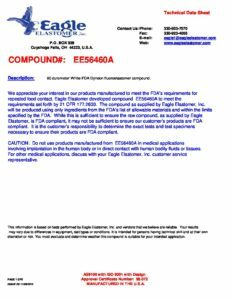 Dyneon Fluoroelastomer Compound EE56460A - Eagle Elastomer Inc.
60 durometer White FDA Dyneon fluoroelastomer compound.  Min torque: 1.87 Inch/lbs.  Max torque: 8.47 Inch/lbs.  Cure Tc90: 2.08 Minutes.  Conditions: Press cured 15 minutes @ 370º F (188º C) and Post cured for 16 hours @ 400º F (204 ºC).  Shore A Hardness (Per ASTM D-2240): 62 Pts.